Balance is a super power. Kids have fun & get fit learning yoga moves from animated characters right out of a cartoon, storybook, app, and flashcards. Go start to finish or pick your pose – over 75 combinations. Our mission is to bring health, mindfulness practices, and play to children through yoga fitness. A great introduction to the world of Super Stretch! Twelve poses come alive with video, animation, music and real kids learning right along with you. Your adventure is guided by Super Stretch and led by our amazing cast of animated characters. Great for all skill levels and ages. FREE on iTunes & Google Play. How Can We Get Kids Moving? Make it fun. Stress, anxiety, childhood obesity, juvenile diabetes, and ADD/ADHD are on the rise. It is an epidemic! Schools, parents and health programs all need ways to help children achieve ease, health & happiness. Super Stretch is here to offer kids & parents positive tools to create BALANCE — and have fun. Growing & Sharing with Yoga, everyday! Make 'Breathe. Stretch. Play.' part of every day! Your support helps create our next adventures with Super Stretch and ultimately impact more kids and families to live healthier, happier lives. Thank you for making the whole world “Super” inside and out! Super Stretch is a great program that not only gets kids to move, but it also inspires a healthy and active lifestyle for life! Super Stretch is one of, if not the best app on the market for young children. As an owner of a yoga studio I know that starting the yoga journey early is not always easy for kids, but with The Adventures of Super Stretch it is. A simple, fun, and healthy way for a child to begin their own yoga adventure. Super Stretch transforms yoga into a magical and highly engaging experience for children. We LOVE the app! Lucy & June have been playing it over and over… doing the moves! It’s so cute, positive, and age appropriate! 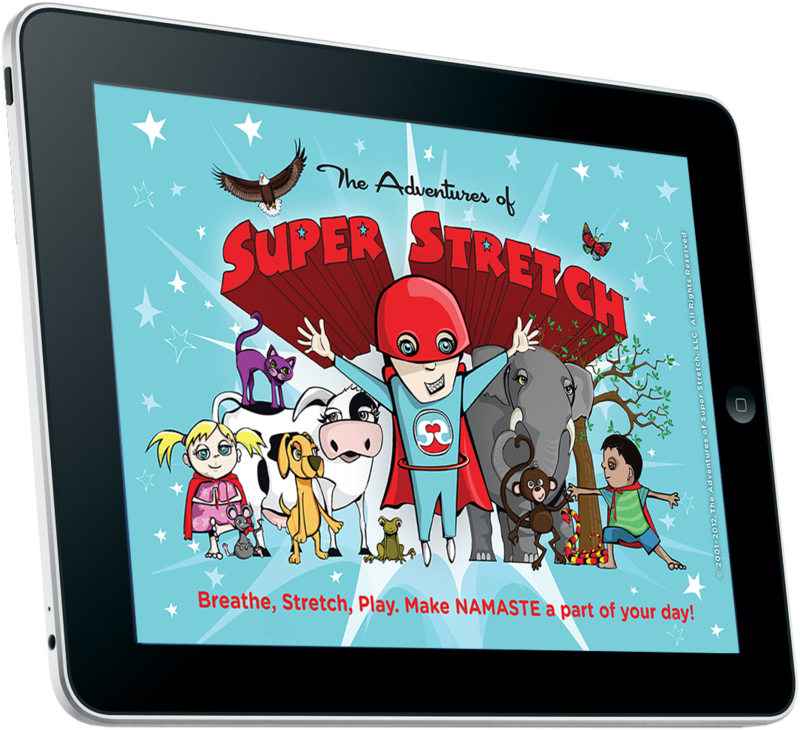 Super Stretch is a fun and engaging tool to teach kids simple breath and yoga movements. The videos of kids are great and make learning yoga look easy! Levi (5) loved setting up my iphone in the living room and going through every animal tonight. Phoenix (2) also loved holding the phone today and imitating every animal. It's amazing! Have you downloaded the award winning ‘Super Stretch Yoga’ mindfulness app yet? Practice with your little yogi today!